French: Goglu de pré; German: Bobolink; Spanish: Charlatan, Triste-pia. 6-7 in (15-17.5 cm); female 0.9-1.6 oz (26.5-44.3 g), male 1-2 oz (28.5-56.3 g). Sexually dimorphic in color. 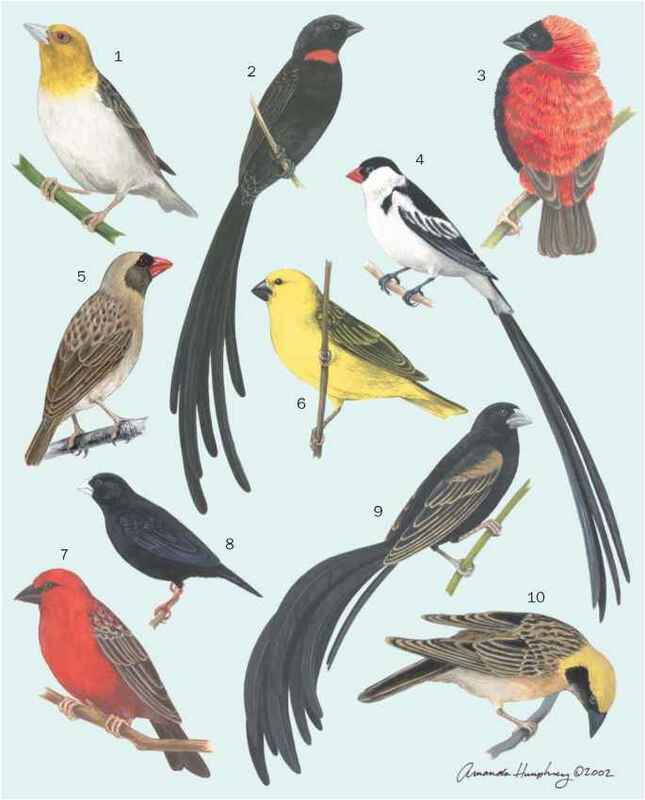 Males black face and underparts, light yellow on the back of head and nape, pale grayish white rump, wings black with pale edges to some of the feathers, white scapulars, and a white-tipped black tail. Males in winter, females, and juveniles brown or yellow ochre, with a pale stripe above the eye, streaked and mottled back, pale throat, and varying amounts of streaking on the breast and flanks. Not threatened. Common to abundant, and has benefited from the clearing of land for agriculture, and wild bird feeding. Missouri, and central Virginia. 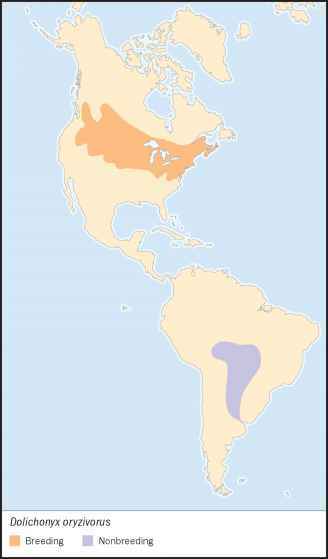 Winters in the pampas of southwestern Brazil south to central Argentina. Breeds in moist grassy meadows or old fields. Originally wintered in grasslands and marshes, but now commonly is found in rice fields. Territorial during the breeding season. Males defend a territory with flight-songs, fights and chases. In migration and winter, often occurs in large flocks. Forage on the ground. Young are fed insects and other invertebrates. Winter diet is mostly various grains and seeds. Males are paired simultaneously with several females. Females select the nest site and build the nest, which is an open cup of woven grass and other vegetation, placed on the ground, often at the base of a forb. Three to seven (commonly five) eggs are laid from mid-May to mid-July. Incubation 12-14 days; fledging at 10 or 11 days. Single brooded, but replacement clutches may be produced. Not threatened. Widespread and locally common, but numbers declining in many areas. Destruction of suitable habitat in both their wintering and breeding range may be affecting numbers.